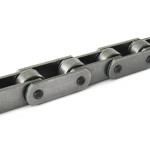 Conveyor chains acc. to DIN 8165 and DIN 8167 are the result of consistent further developments in bush chains and are ideal for almost all conveying and transport systems (can be used both for piece and bulk goods). Metric pitches and designs without rollers or with small, running or flanged rollers or with a wide variety of attachments allow the most diverse uses.